Signer: James Ash (in red), Samuel Massey. Comments: The numbering and first signature in red while the second signature is in black ink. The emblem on the front shows an acanthus plant with a large weighted pot or basket pressing it down, however the acanthus leaves grow up around the pot. Above is the motto: "Depressa resurgit" (Having been pressed down, it rises up again). 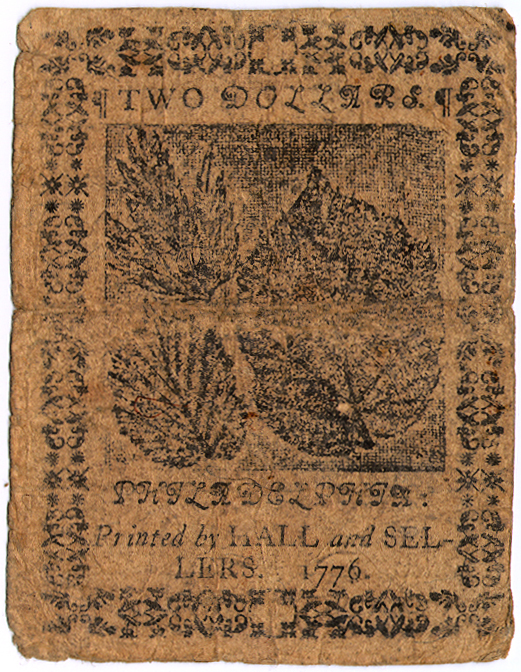 The nature print on the back contains a ragweed leaf and two willow leaves. No image of the back is available. Paper contains blue threads and mica flakes. 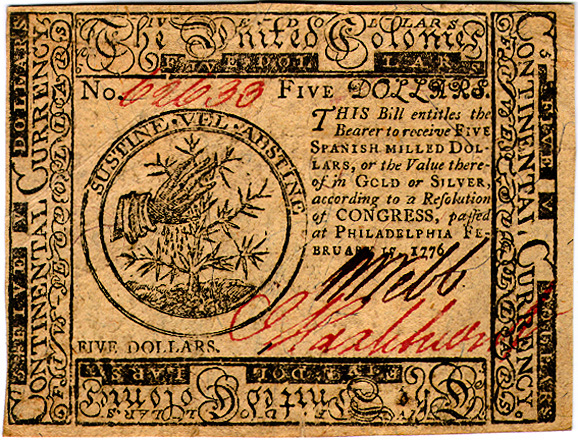 Courtesy of Early American Numismatic Auctions, Inc. Images used with permission from their on-line auction catalog for the auction of April 20, 1996, lot 383. Signer: John Sellers (in red), Isaac Pearson. Size: 74 x 95mm (front border design: 70 x 92mm; back border design: 68 x 89mm). Comments: Numbering and first signature in red ink; the signature in brown ink. The emblem on the front (39mm) shows grain being threshed with a flail and the motto: "Tribulatio ditat" (It is enriched by affliction). 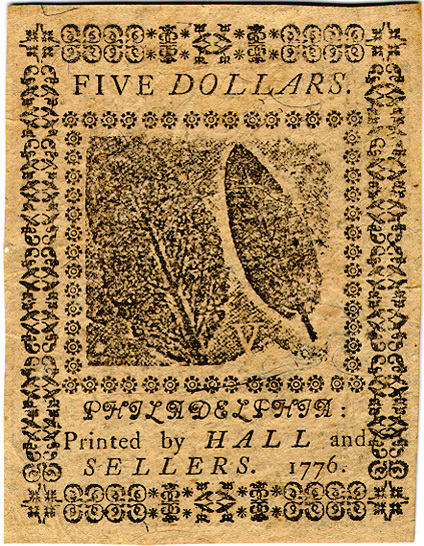 The nature print on the back is of a rasberry and two filbert leaves and is identical to a nature print used on earlier Pennsylvania currency. The paper contains blue threads and mica flakes. Signer: William Webb, Issac Hazlehurst (in red ink). Size: 73 x 95mm (front border design: 69.5 x 91mm; back border design: 67 x 88mm). 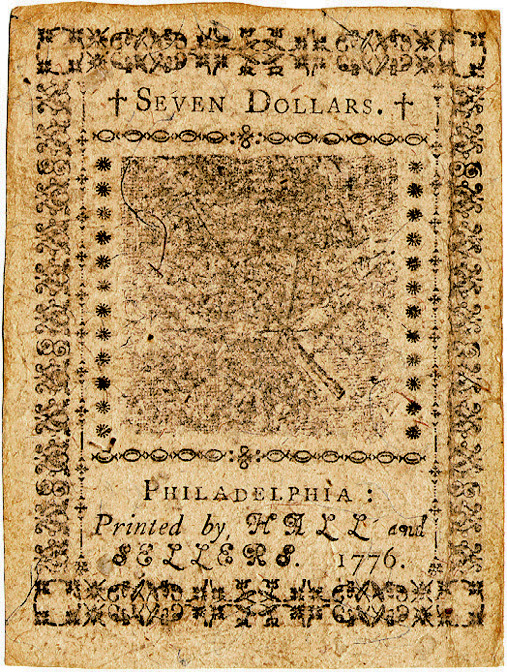 The nature print on the back is of betony and sage and is identical to the nature print used on previously issued Pennsylvania currency. Paper contains blue threads and mica flakes. 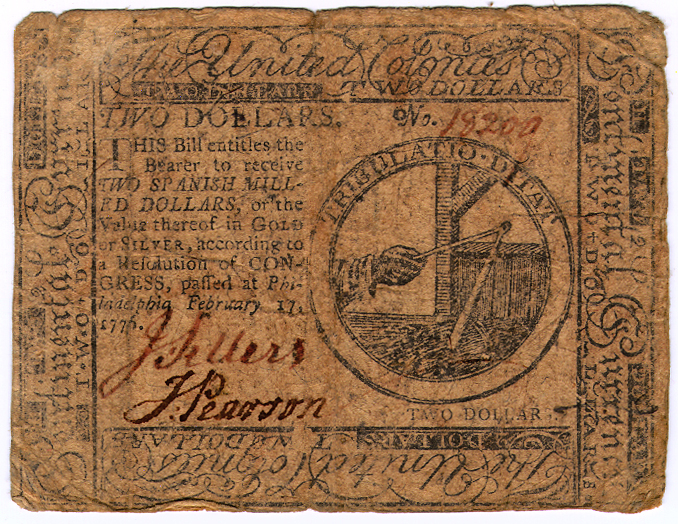 Provenance: Purchased through the Robert H. Gore, Jr. Numismatic Endowment from the EANA mail bid auction of 12/2/95, lot 392. Size: 76 x 100mm (front border design: 70 x 91.5mm; back border design: 68 x 89mm). Comments: Numbering and first signature in red ink; second signature in black ink. 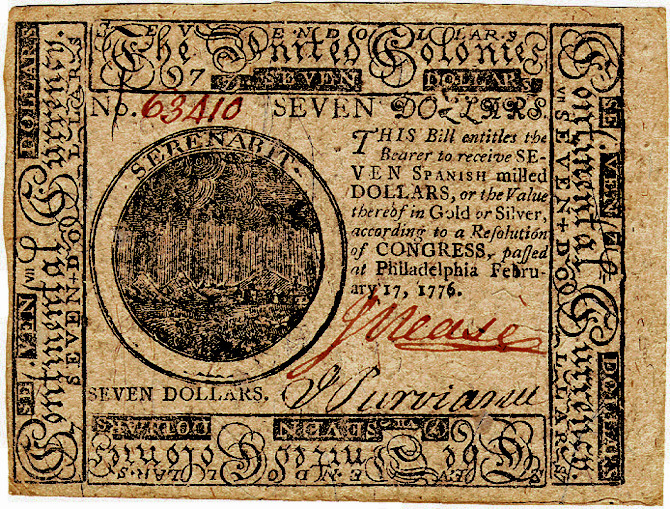 The emblem on the front shows a storm at sea with the motto: "Serenabit" (It will clear up). The nature print on the back is of bettercup. Paper contains blue threads and mica flakes. 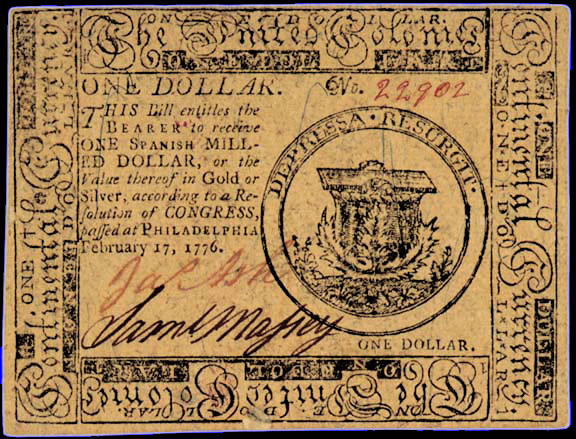 Provenance: Purchased through the Robert H. Gore, Jr. Numismatic Endowment from the EANA mail bid auction of 11/16/96, lot 471.